Drip catchers in many styles for all teapots include paper drip catcher doilies, sponge style drip catchers, and drip clips. Paper drip catchers are die cut and embossed from white absorbent paper. Sponge style drip catchers can be washed when they get tea stained using dish soap and water. 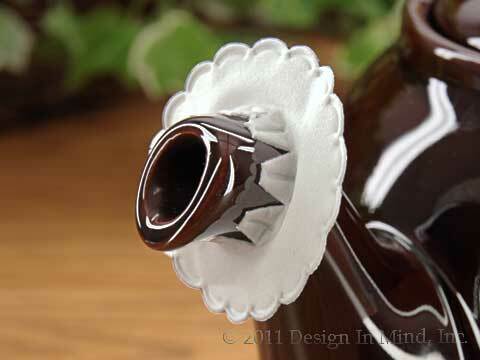 The drip clip fits inside the teapot spout to stop drips from forming.